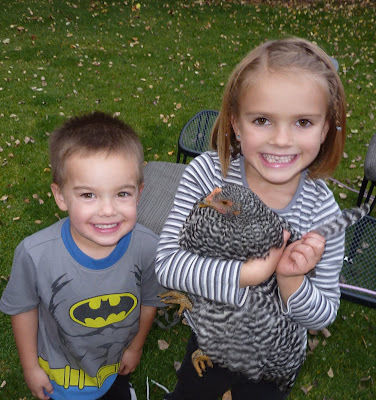 Here is a snapshot of life if you just happen to be one of our backyard chickens. You will most likely spend the majority of the day ravaging Rebecca's already meager garden. 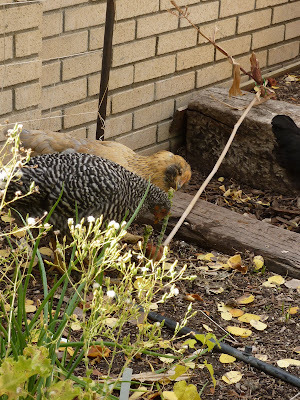 But in case the tomatoes, comfrey, kale, broccoli, swiss chard, beets, strawberries and raspberries weren't enough...Dejected, you may try to nibble on the mounds of rotting fruit all the backyard chicken sites insisted you loved to devour. You will then make your way to the deck. Leaving a highly incriminating trail of evidence behind you. Waiting for the single moment when the stars align, Emmett has recently eaten, Rebecca has yet to sweep the floor, the french doors are open, leaving the kitchen floor precariously exposed. In you hop for a free lunch. But your quiet little "ba gocking" gives you away. In a panic you run out of the kitchen and flee to your coop with Rebecca screaming and waving any sort of threatening object she might have in her hand at that particular moment. ...to my little hens' credit, I couldn't find a single poop on the deck today to snap a photo of, for your enjoyment. But I am in no way complaining! But more times than not, if Ellery is around you are reigned in by your tail feathers into a tight but extremely adoring strangle hold. You are then passed around and poked and prodded until you finally give up the struggle. Then in a time honored tradition, known to farmers for centuries you are hypnotized. ...For this. A make-shift chicken playhouse. The windows and doors darkened by blankets and pillows. But can you complain when you are trapped with these two cute little cousins? 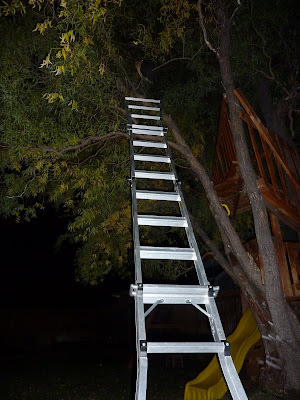 Until finally you and your little partner in crime have perched yourselves 25 ft up the tree. You huddle together for hours, oblivious of the rescue ladder so carefully and lovingly placed by Brent. So you huddle together, roosted and clueless. As dawn breaks, Ellery runs out, panicked. Finally you decide after a long night, you probably should come down to torment Rebecca for another day. 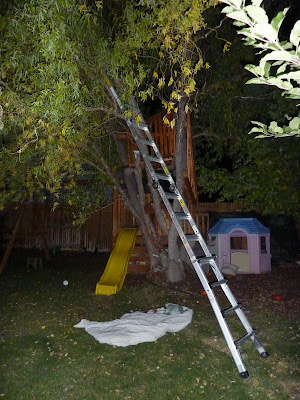 So you deftly hop back down the tree, into the top story, bottom story, and into your coop. Long sigh.... it is good to be a chicken in Rebecca's backyard. 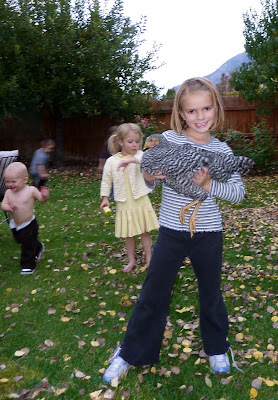 So so funny, it's amazing what we allow our little ones to do to animals. LOL Our cat takes quite the beating from Sav, in her eyes it's only love. Beautiful backyard with all the leaves falling.